Hi folks! 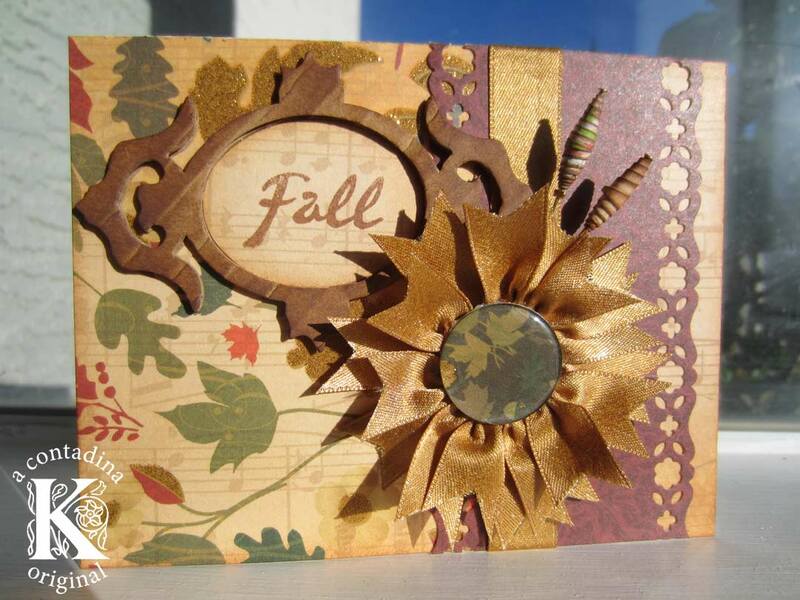 Vivian here today to share with you a card I just finished that was very much inspired by this beautiful time of year. Right now in Vegas, temps are fluctuating. Some days, there's a bit of a bite in the air that requires some bundling. And others, you could get away with shorts and a T-shirt! It's a welcome change from our stifling summers, and now the pooches and I look forward to brisk and lengthy walks together every day. While the change of colors here is not nearly as spectacular as the autumns I grew up with, I fondly remember that incredible East Coast display and a feeling when I was young that my world had turned golden. For this project, I used Shimmer Gold Satin from Really Reasonable Ribbon to make my focal image. I love how this stuff glistens in the light. And it was substantial enough to maintain its shape when cut and sewn as shown in detail below. 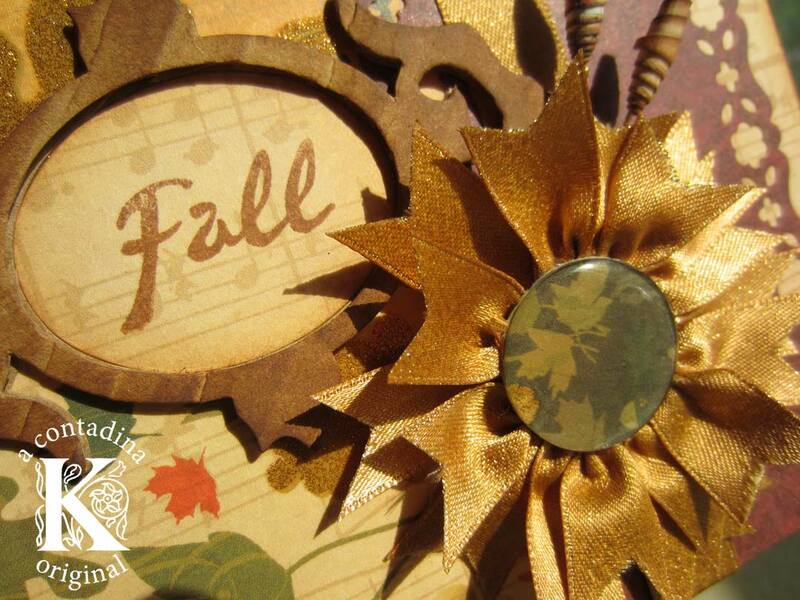 In addition, I used "Autumn Melody" papers that I won from DCWV for my video making skillzzzzz woo hoo! To bump up the textures, I upcycled some corrugate with a new acquisition, a Sizzix "Frame, Fancy" die designed my Karen Burniston to frame a sentiment from TPC Studios. The maroon border was punched with a folksy Martha Stewart edger punch, and I handmade the stick pins using paper scraps! 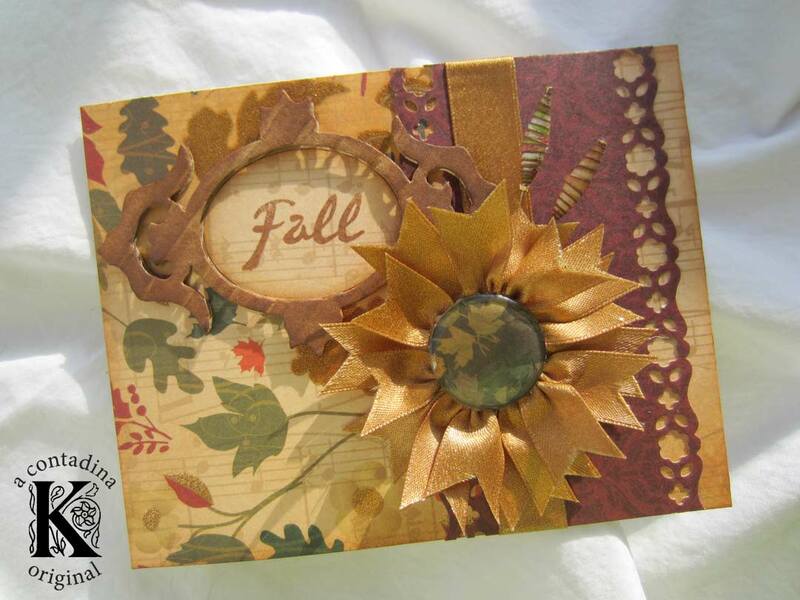 For the center of the bloom, I used the same DCWV papers with an Epiphany Crafts tool for a perfectly coordinated accent. Thanks so much for visiting with me today! Hope you'll stop by for regular inspirations!!! Oh and FYI, a request came in on my blog to show how I made the flower on my altered chipboard box that showcased here earlier this month for our Challenge #60, "Anything But a Card + Ribbon." So there will be a video tutorial link on my blog this Friday illustrating how to make it. Our RRR challenge is still going on, btw! Are you gonna play along? Looking forward to seeing all your creations! Wow - what a gorgeous card Vivian!! Love that pretty gold ribbon flower. Love the ribbon flower. I have sooooo much ribbon this is a great way to use it up. Thanks for sharing!